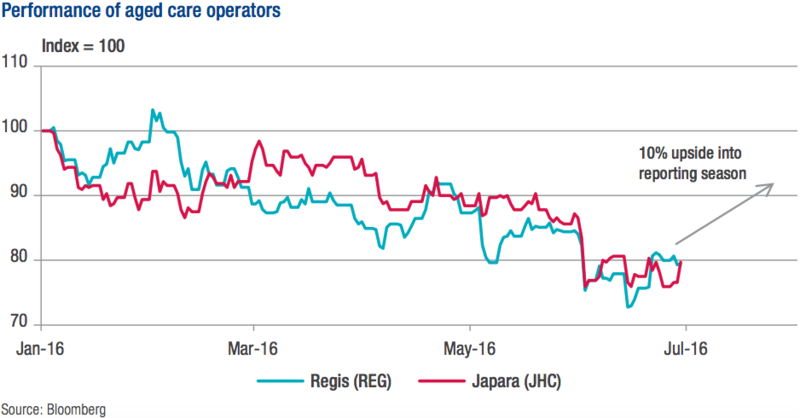 The two listed aged care operators we formally cover – Regis Healthcare (REG) and Japara Healthcare (JHC) – have come under significant selling pressure (fallen over 15%) since the Budget cuts were announced in May. In response to the higher-than-expected increase in residential aged care funding, the government has announced changes that relate to a redesign of the complex health care (CHC) scoring matrix. These changes are estimated by the government to save A$1.2bn, although much of these savings are expected in 2019 (approximately 40%). We expect the aged care operators will be able to partially offset the reduced growth in government payments by charging higher resident fees and increasing accommodation prices. After these changes are implemented, the government forecasts expenditure will grow by 5.1% pa to 2020. The industry remains highly fragmented despite the recent acquisition activity (Regis acquiring the Masonic portfolio and Japara acquiring the Profke portfolio). The changes announced will put additional pressure on the business models of all operators, but in particular, the weaker operators will become less viable. This provides an opportunity for the well-run operators like Regis and Japara. We believe the current share prices of both providers account for the uncertainty surrounding the budget cuts and we can see share prices moving up by approximately 10% into the August reporting season. Both companies offer a reasonable yield of approximately 4% fully franked. We recommend clients add either Japara or Regis to their portfolios.